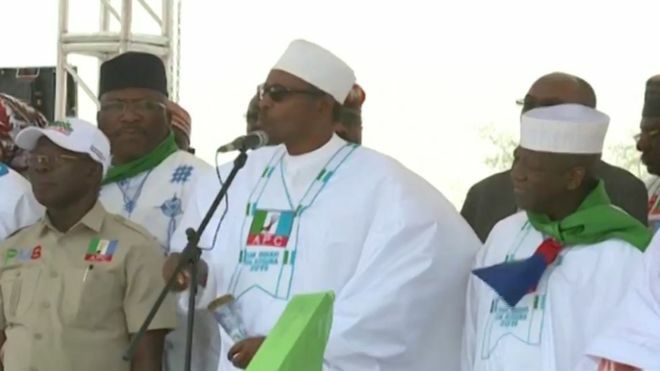 President Muhammadu Buhari has expressed hope that the crisis threatening the inclusion All Progressive Congress, APC Candidates in Zamfara in the coming general elections will soon be over. “Our party decided to go for either Direct Primaries, Indirect Primaries or consensus during the last party Primaries ahead of the upcoming general elections but we experienced challenges in eight states including Zamfara. Earlier, the state governor, Abdulaziz Yari told the gathering that the party in the state had followed its case through the courts of law and pleaded with the Independent National Electoral Commission (INEC) to respect the court’s ruling and allow the party’s Candidates to participate in the election. In the Presidential campaign were Ministers of Defence, Mansur Danali and that of Interior, Abdulrahman Dambazau as well as former governors of Zamfara, Borno and Sokoto, Ahmed Yarima, Ali Modu-Sheriff and Aliyu Wammako among others.